Computational Chemistry, organometallics, bio(in)organic systems, large systems simulation, radicals. The Catellani reaction is a well-established method to couple aromatic rings throught the use of palladium catalysts and norbonene in cooperativity. 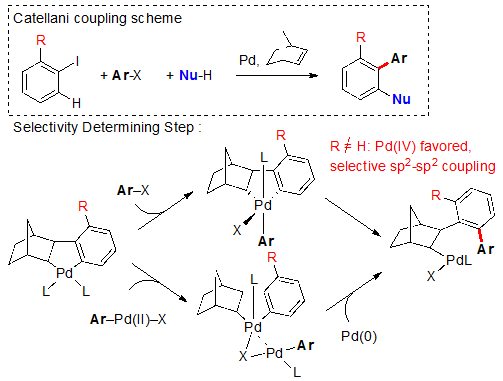 We have shown that the palladium catalyzed reaction of ortho unsubstituted aryl halides and norbornene has a good probability to occur through a transmetalation mechanism, energetically favored over the Pd(IV) one. The reported unselective sp2-sp2 and sp2-sp3 coupling can be explained in the framework of the transmetalation pathway since the transition state energetic difference between aryl attack onto the aryl or norbornyl carbon of the reacting palladacycle is quite small. On the other hand, the experimentally observed “ortho effect” stipulates that in palladium and norbornene catalyzed domino reactions involving ortho-substituted aryl halides, selective aryl-aryl coupling only occurs. Our work offers the first possible rationalization of this fact. When in situ formed metallacycles, containing an ortho substituent, undergo oxidative addition of an aryl halide, the process becomes less energetically costly than the one involving reductive elimination from the transmetalation intermediate, which would be subject to steric clash in the transition state. The now accessible Pd(IV) intermediate features a Y-ditorted trigonal bipyramidal structure from which an easy reduc- tive elimination can account for the reported selective aryl-aryl coupling. The research activity has been especially innovative in the recent years regarding radicals based on derivatives of boron and carbenes. We have shown that it is possible to generate a boron-centered radical through a homolytic BH bond breaking when an adduct is formed between BH3 and a N-heterocyclic carbene. We have further extended this reactivity by generating boron-centered anion by using chemically induced 2e- reduction. A rationalization of the experimental observations has been done with various computational methods and allows us to better understand this new chemistry. 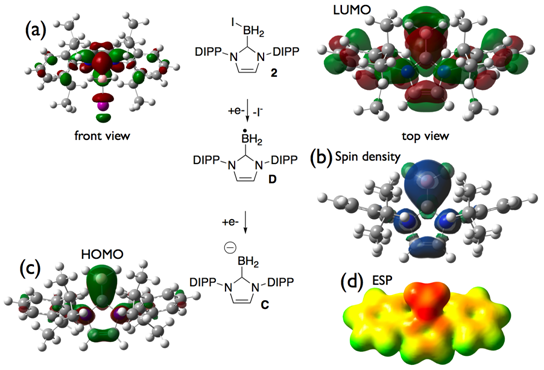 Compound D is a radical centered centered on boron, as shown by the spin density labeled (b). Further reduction leads to an anion which is itself mainly localized on boron, as shown by the HOMO labeled (c) and the electrostatic potential labeled (d). Sept. 2001-Sept. 2004 :	Ph. D. Thesis, UMR 6519 « Réactions Sélectives et Applications », Université de Reims Champagne-Ardenne, under the joint direction of Pr. Bouquant and Pr. Humbel. 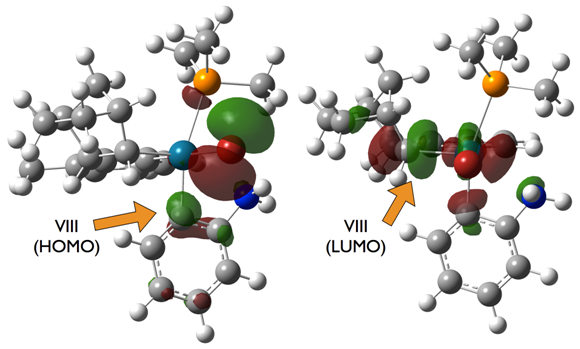 Of the Ortho Effect in Palladium/Norbornene-­‐‑Catalyzed Reactions : A Theoretical Investigation G. Maestri, E. Motti, N. Della Ca’, Max Malacria, E. Derat, and M. Catellani J. Am. Chem. Soc. 2011, 133, 8574–8585. Regioselective Activation of Oxo Ligands in Functionalized Dawson Polyoxotungstates C. Boglio, K. Micoine, E. Derat, R. Thouvenot, B. Hasenknopf, S. Thorimbert, E. Lacôte, M. Malacria J. Am. Chem. Soc. 2008, 130, 4553-4561. Structure and quantum chemical characterization of chloroperoxidase compound 0, a common reaction intermediate of diverse heme enzymes Kuehnel, K. ; Derat, E. ; Terner, J. ; Shaik, S. ; Schlichting, I. Proc. Natl. Acad. Sci. (USA) 2007, 104, 99–104.